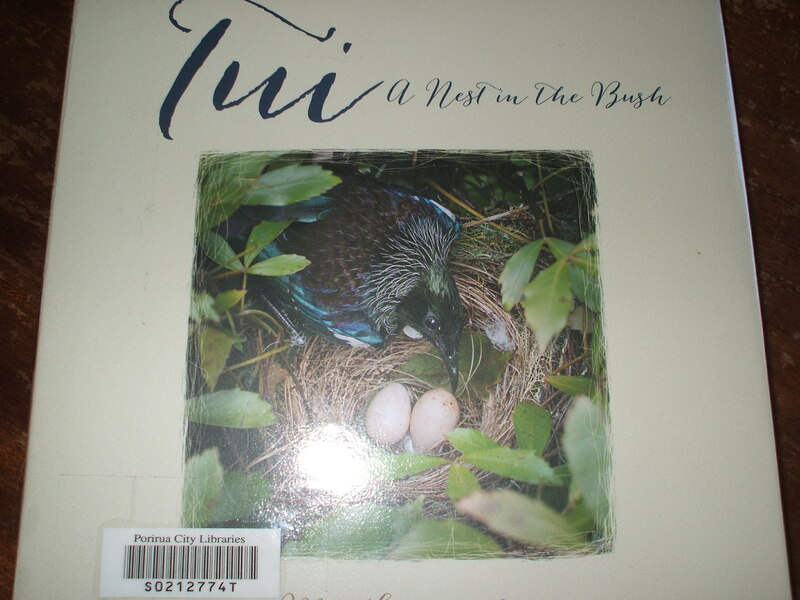 Tui – A Nest in the Bush by Meg Lipscombe. 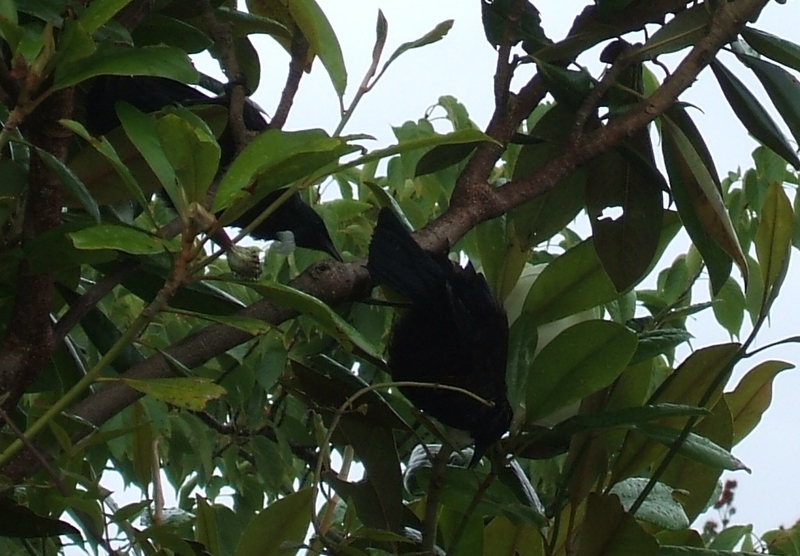 Regular readers of my blog know of my interest in and love of Tui and other native New Zealand birds. As a child Tuis were very rarely seen but the persistent and devoted action of many people and organisations now sees these birds arriving in my garden and surrounding neighbourhood in increasing numbers. It is a joy. So I was delighted to spot this newly published book in the Public Library. Meg Lipscombe’s stunning photos of a Tui nest and the breeding cycle have filled in more gaps in my knowledge of these colourful, spirited birds. 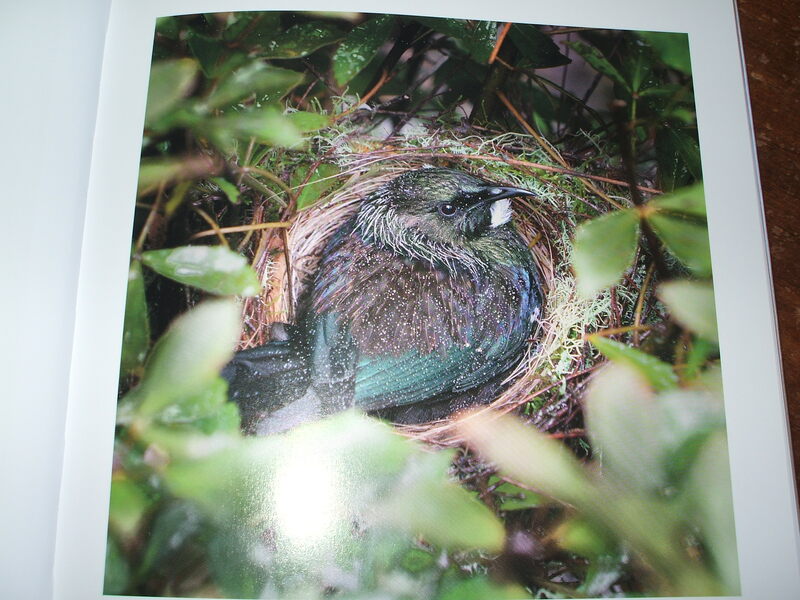 Meg lives in a remote part of New Zealand and discovered to her delight that she could photograph a Tui’s nest from her home’s balcony. Female Tui sitting on two eggs. What followed was a successful recording over 37 days of newly laid eggs through to an empty nest as the fledglings took those final steps to growing independence. 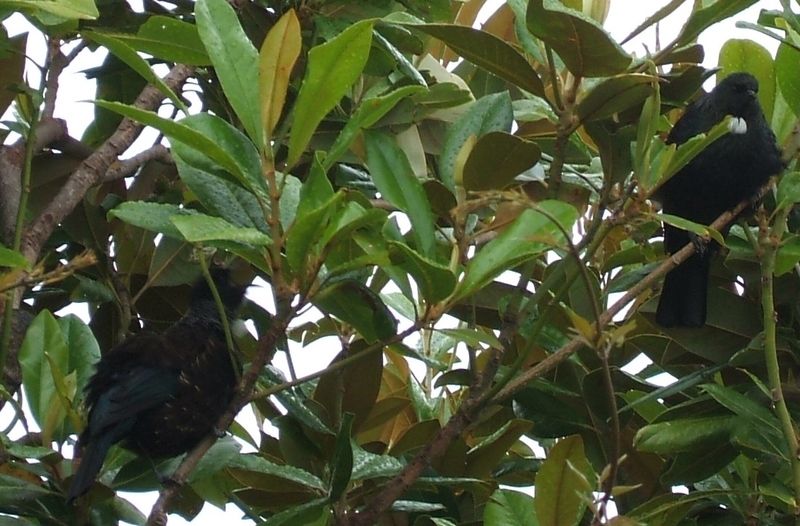 Tui fledglings almost ready to leave the nest. Meg spent time speaking to the adult birds so that they grew accustomed to her respectful presence. For the reader she journalled about her observations. 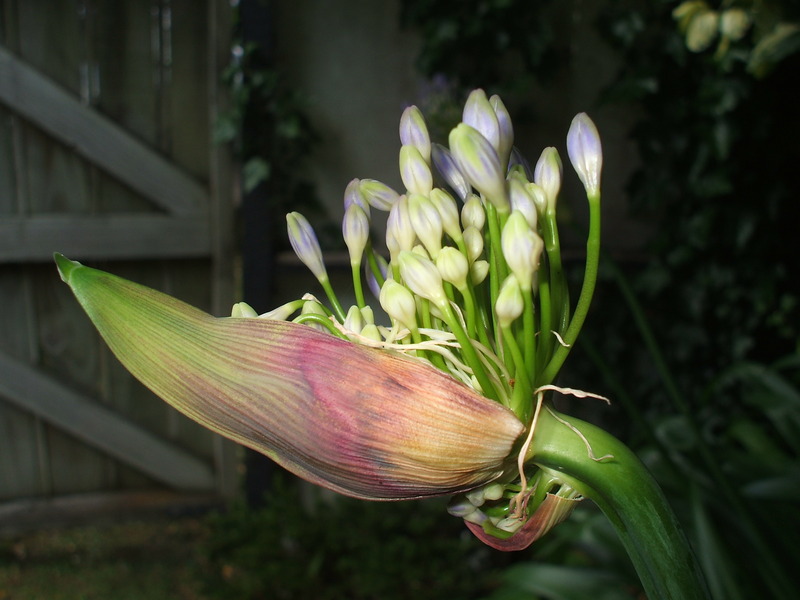 The book is a first to capture this breeding cycle and it is not surprising to learn that Meg received a Fellowship from the Photographic Society of New Zealand in recognition of the excellence of her photographs. Rick Thorpe wrote a very full and informative Introduction for the book covering many aspects pertaining to the bird, to its significance to Maori, to the health of our native forests and the critical importance of continued conservation efforts. Anyone wanting to learn about Tuis will find this book, with its remarkable photos and written information, invaluable. It is a book to share with young children, for older children and adults to read and explore and enjoy. 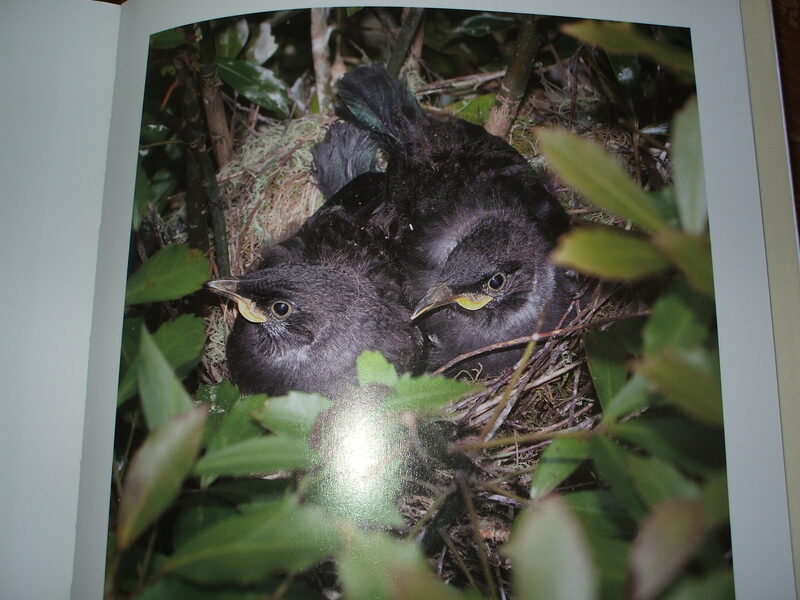 This entry was posted in Uncategorized and tagged "Tui - A nest in the bush", birds, Books, Craig Potton publishing, eggs, feeding, fledglings, journal, Meg Lipscombe, native New Zealand birds, nature, nest, photography, Tui on December 30, 2013 by ordinarygood. 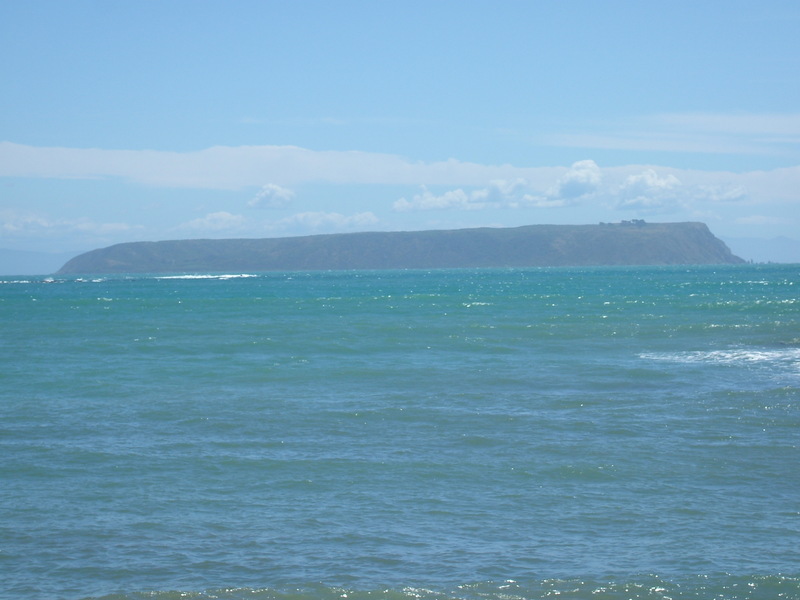 In the week or so preceding Christmas the majority of the Tuis disappeared. This is a pattern I have observed in past years. The Sugar water feeder did not require refilling for two days. 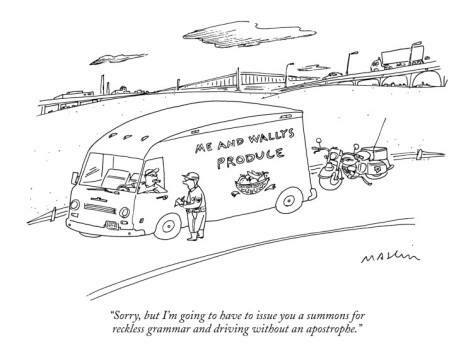 Food supplies may be very abundant perhaps and with warm, dry weather the need for extra “fast food” could well diminish. 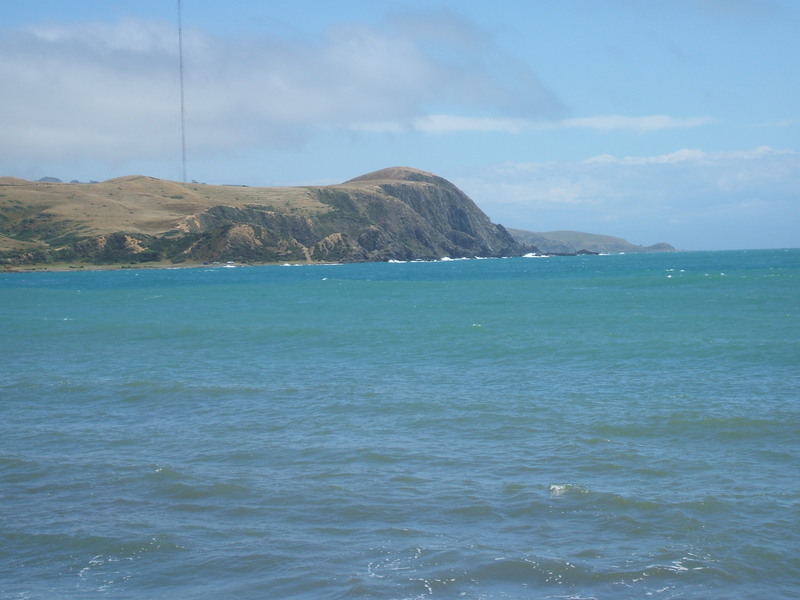 However on wet days or cold, windy days who should pop back but the Tuis…..wise birds with good memories. 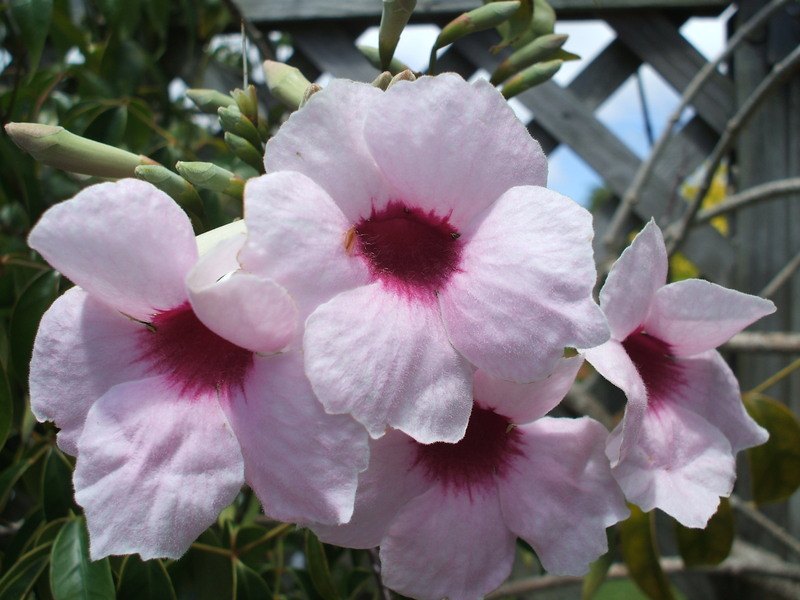 The other possibility is that the Manuka flowers at this time of the year, so yet another addition to their food supply. This year, like so many other natives, it has been a prolific flowering season for Manuka. 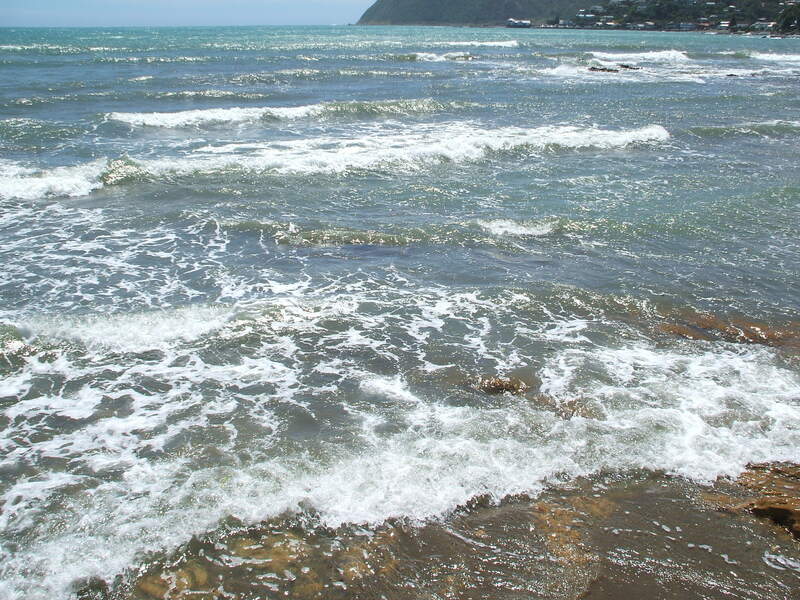 Today the weather has been hot, humid and rainy. Late this afternoon these two appeared and flirted and flitted between the feeder, the white tulip flowered Magnolia and the flowering Pohutukawas across the road. 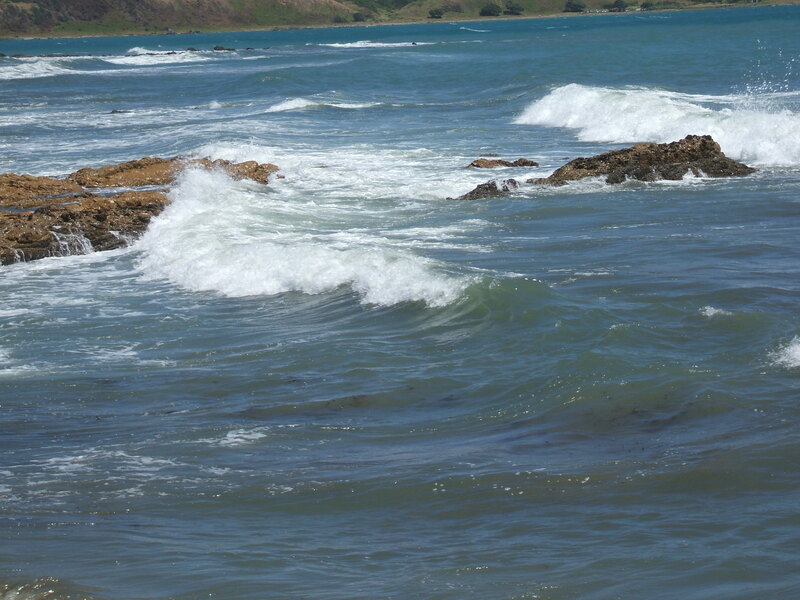 There was much puffery which I have learnt can precede some afternoon delight and very enthusiastic singing at each other as only Tui can. It is lively and loud song but does not prohibit branch hopping and acrobatics all at the same time and then gone!! This entry was posted in Uncategorized and tagged birds, Christmas time, Magnolia trees, nature, New Zealand birdsong, New Zealand native birds, photography, Tui on December 30, 2013 by ordinarygood. 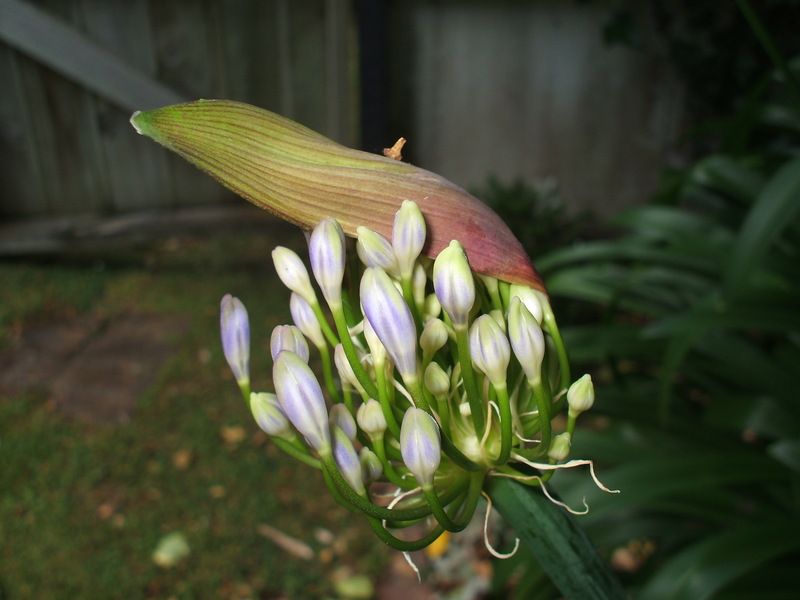 Agapanthus are not my favourite flowers. 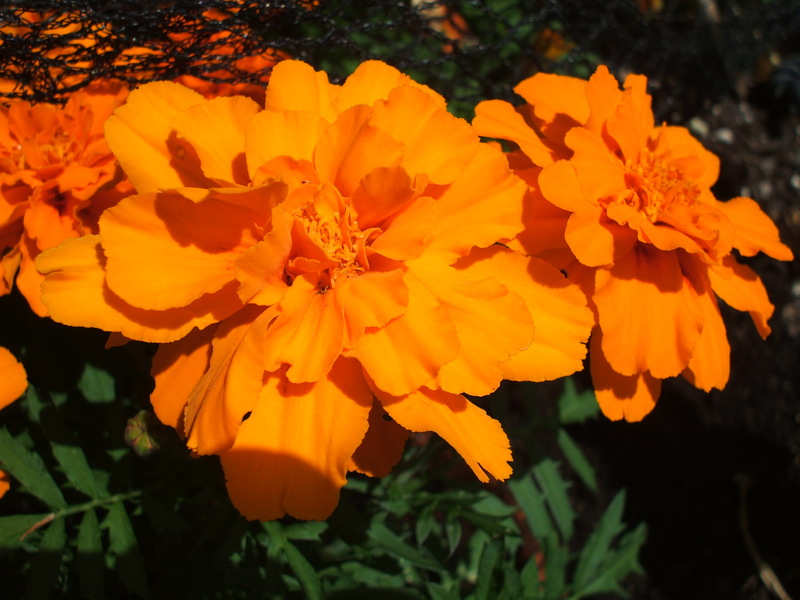 I think they look wonderful in mass plantings and along rural driveways. Sadly my garden is becoming more and more a mass planting. 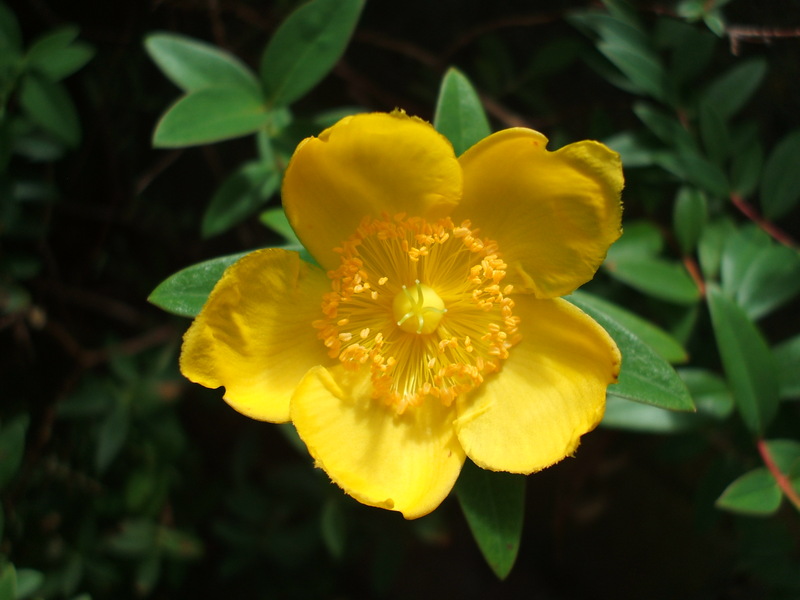 But on a very recent wander about the garden I saw some beautiful aspects to the plant. Will I succeed in conquering my opponent with love? 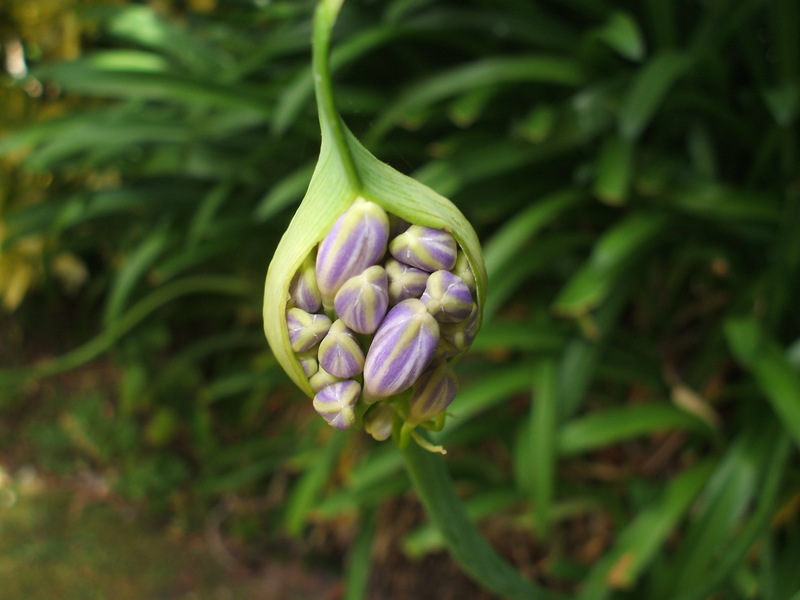 I’m not sure, but I did admire the emerging flowers, colours and shapes that were on display. 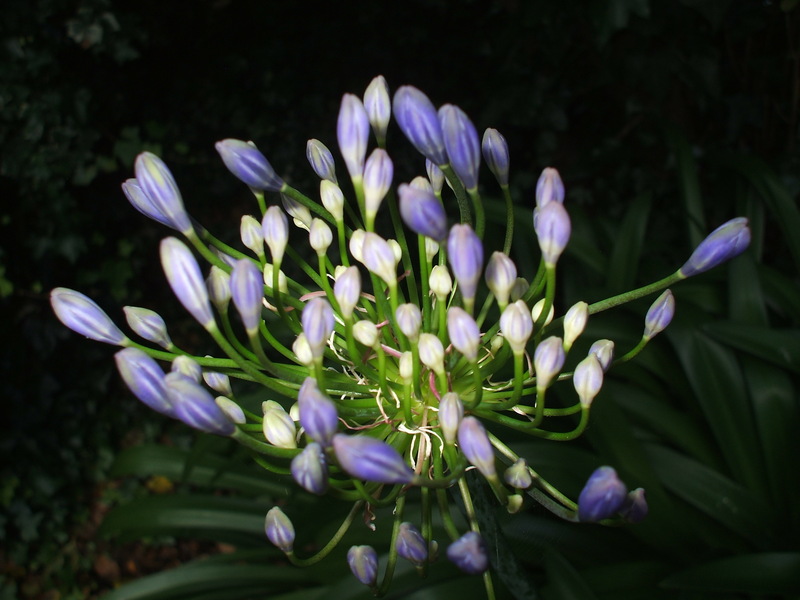 This entry was posted in Uncategorized and tagged Agapanthus, flowers, gardens, Mahatma Gandhi, Mahatma Gandhi quote, nature, photography, Quotes on December 29, 2013 by ordinarygood. 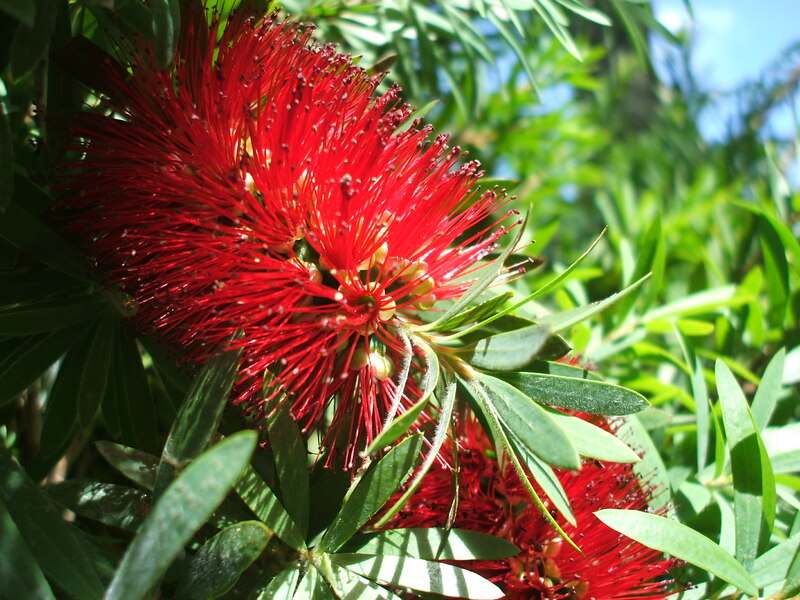 This entry was posted in Uncategorized and tagged beach, bottle brush, christmas day, Karehana Bay, Mana Island, marigolds, Pandorea, Porirua Harbour, Southern hemisphere Christmas, Tasman Sea, Titahi Bay hills, walk on December 25, 2013 by ordinarygood. There has been a pause in my blogging in the past wee while. 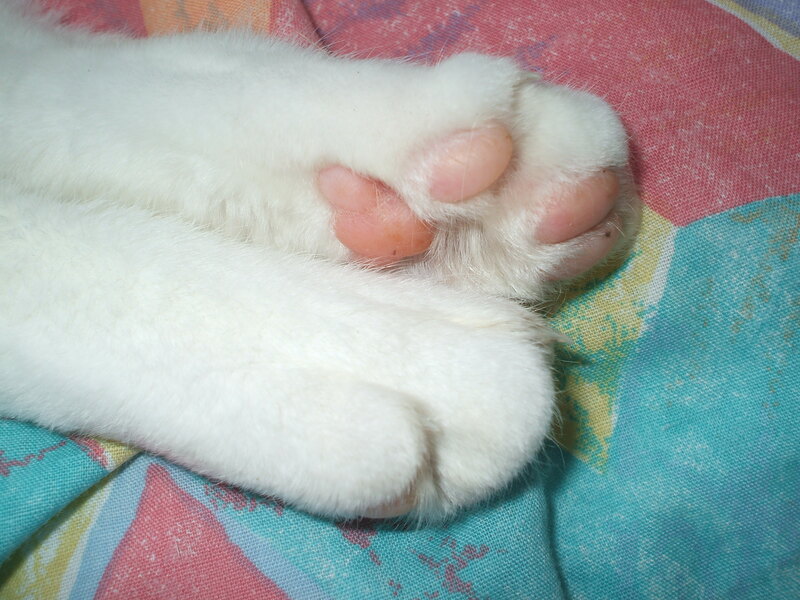 In part it has been due to the owner of these paws. Jazz, our cat, is almost 15 years old and in the past 3 months ageing has suddenly impacted on him. We knew earlier this year that he has arthritis in his lower spine which means he can no longer spring nimbly and strongly using his back legs. Then in August his pain levels increased and it was discovered that he had slipped a disc in his back in a different area of his spine. With advice and treatment from the vet that has healed up. However we then noticed he was limping on his front leg/s. X rays show that he has quite severe degeneration in his front elbows and their elbows take a fair percentage of a cat’s weight as they move about. So Jazz is sore and stiff and now an indoor cat on various medications to support him and keep him as comfy as we can. 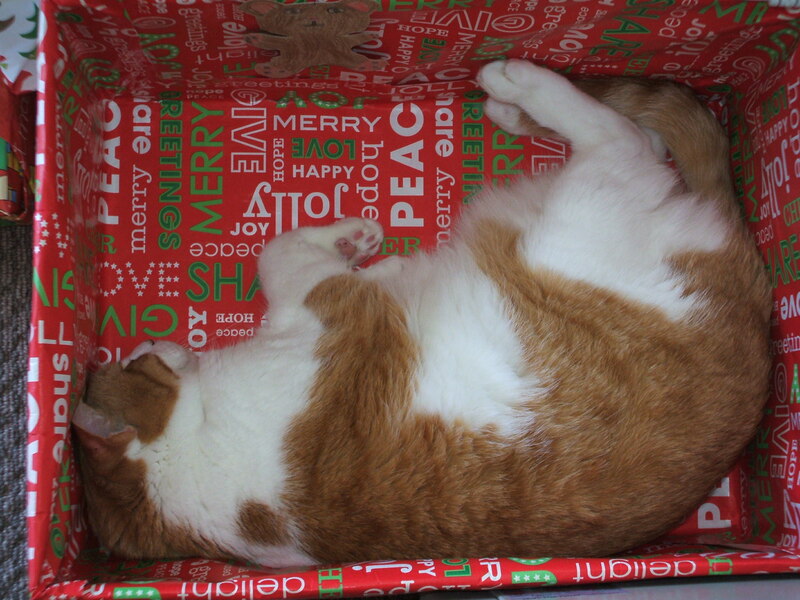 He has always been a very sociable and lively cat. Not one to sleep contentedly in the garden. Neighbours often reported his visits and some of the neighbours lived a fair distance away. I think Jazz has worn out, not rusted out, as the saying goes. Increasing the care of a cat requires increased observation, clock watching to time pain relief, tempting an appetite now borne of suspicion about what else might be added in to the food, encouraging more water consumption during hot days in a hot house and of course lots of extra patting and attention. At the same time I have been hobbling with a sore left knee. I too have some degenerative changes and up until late November there was a mysterious “loose body” that appeared on images of the joint. After several unpleasant locking incidents this year I agreed to an arthroscopy. The “loose body” was deftly plucked out and I am pleased to report that my knee is feeling much freer and lighter. My challenge now is to get my knee moving fully again after all the hobbling about. The joint has become stiff and reluctant to straighten and bend fully. So exercises are a big part of my daily routine now. Holding on to the kitchen bench is a great place for knee exercises and I am on increasingly friendly terms with my physiotherapist. As well I am walking further each day as I rebuild my fitness, stamina and remind my brain to walk normally again. This entry was posted in Uncategorized and tagged arthritis, arthroscopy, cats, Christmas, health, joints, rehabilitation, walking on December 25, 2013 by ordinarygood.